Last time I wrote about this (in Applying for Italian citizenship – part 3) I’d just sent off the documents to register our marriage and our daughter’s birth with the Italian Consulate in London. The next step was to register our son’s adoption, and it’s not possible to do that by post. For this stage, my husband and I had to go to the Consulate in person. Luckily we live close to London, and my husband travels there every day for work, so it’s not a big deal for us to go there. I make an appointment with the notary by email. We’re booked in for a Wednesday morning at 11am. Our son, who’s 15, doesn’t need to come with us to see the notary. This is good news, because he’d definitely prefer to be hanging out with his friends than spend a day going to the Consulate, and getting him there would probably take some persuasion. 1) Application form duly completed and UNSIGNED. I print out and complete (but don’t sign) an Italian form for the Tribunale per i Minorenni – I think this is the Court which deals with adoptions in Italy. 2) Full form birth certificate of the adopted child, issued before the adoption. We don’t have this for our son but the notary at the consulate has said that we can proceed without it, so that’s what we’re doing. I hope that the notary’s right. 3) British full form birth certificate, issued after the adoption, duly legalised and translated into Italian. 4) British adoption court order legalised and translated. The website says that each original document must be submitted with a photocopy. I make two copies of each of the documents – a set for the notary and a set to keep at home. We have to take our passports (mine, my husband’s and our son’s) with us to the Consulate. We also take my husband’s Italian Identity Card. When we book our appointment, the notary tells us by email that she’ll leave our names with Reception at the Consulate. I assume that this means that we can arrive just before 11 and that we’ll be able to go straight in for our appointment. I’m wrong to assume this. It’s a sweltering, hot morning in July as my husband and I walk through the City of London for our appointment with the notary. 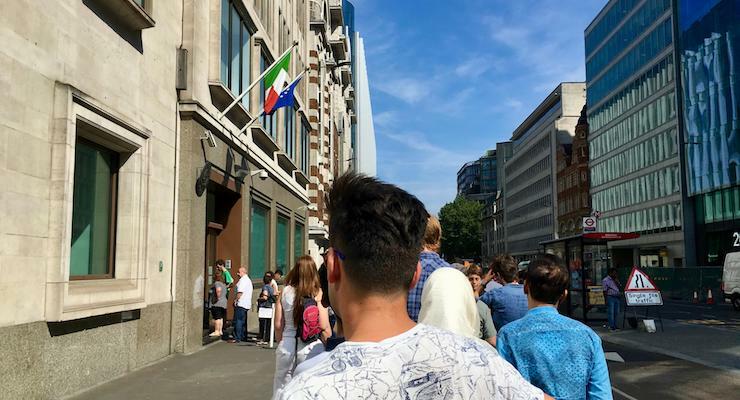 As we round the corner from Ludgate Hill to Farringdon Street, we see a long queue of people outside the Consulate. It’s 10.20 am. While my husband joins the queue, I walk along the queue to the entrance to try to work out what the queue is for. Most people seem to be queueing for passports. I tell a uniformed man at the door that we have an appointment with the notary. He says ‘Join the queue’. So I do. While we wait in line in the burning hot sun, I worry that the notary may not be at work that day, or that we’ll miss our appointment. I email her to say that we’re queueing to get in to the building, and that I hope that we’ll be with her by 11. She doesn’t reply. The queue moves very slowly. It takes us 40 minutes to get inside the building. As we queue my husband tells me of the many, many hours he spent doing this with his family when he was growing up in London. (His parents moved to London from Sicily in the 1950s, and he was born here). When we reach the front of the queue we’re allowed to enter the building, one at a time, via a security door. I go first, as I have the documents. Once I’m inside, my bag is checked by a uniformed Italian man and then he tells me to join the queue for the information desk. My husband joins me, once he’s inside the building. It’s hot, stuffy and crowded inside. It feels like we’re in Italy. After a few minutes I reach the front of the information desk queue and I tell the uniformed man on the other side of the desk that we have an appointment to see the notary. He looks at a list in front of him and finds our names, which he crosses off. He calls the notary by phone, but she doesn’t reply. He tells us to go to the waiting room and that he’ll try to contact her again in a few minutes. We go in to the waiting room, which is crowded with hundreds of people. There are no free seats, so we stand by the entrance. After 10 minutes my husband goes to queue at the information desk again to ask the man there to try to contact the notary. There’s still no answer. My husband says that we will be forgotten about unless we keep queueing up and asking for the notary. So, after another 10 minutes I join the queue to ask again. While I’m queueing, my husband calls me: the notary has come to find us in the waiting room. This is a relief. As she leads us out of the waiting room and up a flight of stairs to her office, the notary apologises and explains that she had been called to see the Consul General, and so wasn’t available to meet us at 11. Her office is cool, airy and quiet. She takes copies of our passports and ID card, then we sign the Italian form in front of her. She asks for my maiden name, as women keep their maiden names in Italy. She explains that once she has checked and certified our documents she will send them to be registered at one of the Courts in Italy which deals with adoptions. This Court will be whichever is the closest to my husband’s family’s home town in Sicily – and she needs to check which Court that is. She says that the length of time that it takes for the Italian Courts to register adoptions varies from place to place, and that it can take more than a year. The notary tells us that the Register Office at the Consulate, which deals with the registration of births, marriages and divorces of Italians in the UK, has an 18-month backlog. This is where I sent the documents to register our marriage and our daughter’s birth. I think that it’s going to take a very long time before my kids or I are actually registered with the Italian authorities. A week after our appointment at the Consulate, the notary emails to say that she’s looked at our file and seen that the Registry Office has sent our marriage certificate to the authorities in Italy for registration. I’m surprised that this has happened so quickly. She also tells us that the Registry Office can’t process our daughter’s documents because she’s over 18. The notary says that our daughter is entitled to Italian citizenship, but that it has to go through the Citizenship Office rather than the Registry Office. In order to apply for citizenship, our daughter has to make an appointment to go to the Consulate in person, and she will need to pay 300 euros for her application. Our daughter’s birth certificate and other documents are returned to us by post (I’d supplied a Royal Mail prepaid Special Delivery envelope for this eventuality), and she embarks on the tricky process of trying to book an appointment at the Italian Consulate Citizenship Office in London. I’ll let you know what happens next.